Sie Kensou (椎 拳崇) is one of the young psychic powers wielding disciples of Chin Gentsai who has an unrequited crush on his teammate Athena Asamiya. Sie Kansou is a Chinese schoolboy who can wield Psychic Powers. That's why he was choosen to be part of the Psycho Soldier Team. He and his teammate Athena Asamiya (who he has a crush on) are trained by their mentor Chin Gentsai to prepare for "the worst case scenario of oncoming evil". 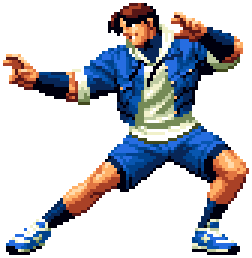 Chin uses the KOF tournaments since the 1994 tournament as a method of training for such an event. By pitting his students against other fighters, he hopes to increase their skill and power better than any training could ever achieve. The food that Kensou sometimes eats before or during matches are baozi. This page was last edited on 20 January 2009, at 20:03.